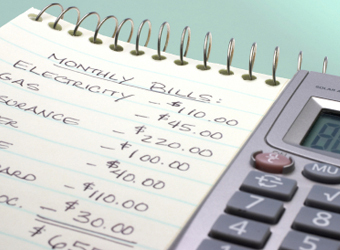 Making a budget your family can stick to isn’t easy. We asked Jean Chatzky, ThreeJars’ money expert and financial editor of NBC’s Today show, how to do it right. We know this sounds like a real chore, but you really can’t create a realistic budget until you know where your money goes. So jot down everything you pay cash for, and check your debit/credit statements for at least a month. Then get organized by using a tracking method that you’re comfortable with. Some people like to use pen and paper and sort through saved receipts, while others prefer using web applications like Quicken or Mint.com’s website or mobile app. Just find a method you’ll stick with, says Chatzky. DON’T assume small amounts don't count. Your latte may be a lifesaver in the morning, but that $3 or $4 a day starts to add up quickly! Don’t nix guilty pleasures from your life completely, but do be mindful that the little purchases you make throughout the day impact your budget. “Figure out your priorities; if you really want that latte, find somewhere else to trim so you can afford it—take a bus instead of a taxi or bring last night's leftovers for lunch,” suggests Chatzky. DO get your spouse onboard. In order for your family to stay on budget, you and your spouse have to remain in sync about your financial goals. Set weekly or monthly money meetings to go over your expenses, as well as where you each feel you could cut back or need to save more for—maybe you need to skip takeout dinners in order to buy that flat screen TV you’ve both been eyeing. Be sure to take note of your achievements, too. You guys clipped coupons even though it’s a pain? Pat each other on the back! DON’T assume your spouse's splurges will be the same as yours. DO understand you have to make some tough cuts. Creating a doable budget is really about sitting down and analyzing your priorities, says Chatzky. If you’re spending more than you make, or if you’d like to save more, make a list of all your discretionary expenses, and rank them by how much you’d feel it if you were to cut them. Also, see if you can negotiate down your monthly bills: “Call the cable company to see if you can get a better rate, refinance your mortgage if it makes sense, consolidate your cell phone plans, or drop HBO when your favorite show is off-season,” says Chatzky. DON’T assume your financial choices will ruin your life. You may cringe at the prospect of not being able to get your hair cut as often as you should or buying your kids as many toys as you’d like, but remember: Doing these things now will put your family on a better financial course. And your budget can be flexible. You can swing that salon visit if you make sacrifices elsewhere. Indeed! We can all relate to the difficulty in teaching kids about delayed gratification - especially in today's world of consumerism. We encourage paying an allowance (even if a small one) to help them practice these concepts responsibly. Check out our Nag-U-Lator on the homepage for more insight.